Zimbabwe wildlife safari day by day itinerary. Arrive at Victoria Falls Airport where you will be met and transferred to spectacular Gorges Lodge perched high atop Batoka Gorge above the Zambezi River. Enjoy an afternoon wandering the grounds or relaxing by the pool, followed by sundowner cocktails while watching black eagles soaring along the cliff face. Enjoy early morning coffee or tea on your private veranda overlooking the gorge, then a sumptuous breakfast to fuel your full day of activities. 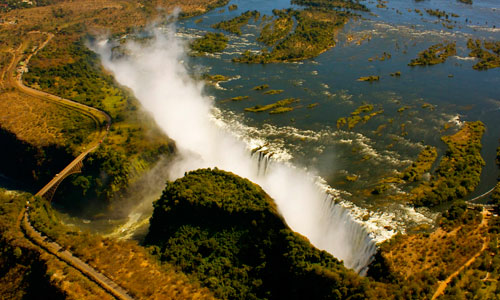 After breakfast, head to Victoria Falls town to view the star attraction—Mosi oa Tunya—the smoke that thunders. Following your visit to the falls, it's on to Camelthorn Lodge situated in the South Eastern corner of Hwange National Park. You will drive to the rail depot at Dete, where you board your private Elephant Express rail car for a unique game viewing experience. En route, lunch and drinks will be served. Upon arrival, a short game drive will take you to your beautifully appointed lodge nestled on the edge of Hwange National Park and Ngamo plains, famed for its herds of elephants. After settling in your accommodations, enjoy a sundowner cocktail, followed by a three-course dinner. An optional early morning walking safari, exploring the woodland and nearby Ngamo plains for game, before you embark on your vehicles for Ngamo Village 15 minutes from the lodge for a very special morning that gives guests a chance to experience a very real and unchoreographed interaction with villagers. The visit culminates in a tour of the school and a singing performance by some of the children followed by a class interaction where children have an opportunity to meet guests and vice versa. Pack for a full day trip into the park for a one of a kind "pump run" with a picnic and siesta under the trees. Combine game viewing in remote areas of the park with practical hands-on conservation, assisting your guide with supply and maintenance of the wells that are the heartbeat of Hwange and its wildlife. Transfer to Ngamo Siding and board the Elephant Express rail car for a slow ride up the railway line, game viewing all the way to Dete Station. Disembark and board game viewing vehicles and proceed to Nehimba Lodge. Enjoy viewing game collecting at the lodge's waterhole at sundown. A morning of game drives and game walks in the beautiful northern part of Hwange National Park. Return to the lodge for lunch, then afternoon game viewing with refreshments and canapés at susnset overlooking one of the waterholes. Game drive up to Mandavu Dam for a picnic lunch, a wonderful hilly location for both bird watching and game viewing. Return to the lodge in the afternoon and relax on the deck overlooking the waterhole. Travel by road, game viewing through Hwange National Park to Zambezi National Park, along the banks of the Zambezi River. Settle into your luxury tent and then relax on an evening sundowner cruise. Enjoy an early morning coffee or tea on your private veranda, then join a morning anti-poaching patrol near camp. Returning to camp, a delicious brunch will be prepared on the deck. Enjoy a lazy afternoon relaxing in your splash pool with relaxing views of the Zamezi. Return to camp for afternoon tea and a short siesta, followed by a game drive, stopping to enjoy sundowners on the banks of the Zambezi River. 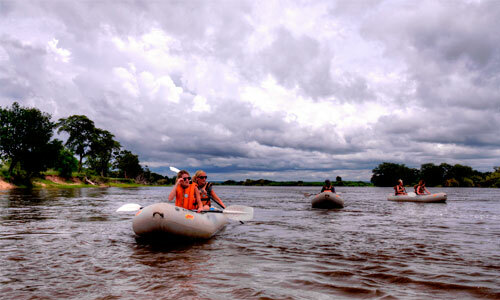 Explore the beautiful islands around Zambezi Sands by canoe, keeping a look out for a variety of game along the banks. Stop off on one of the islands for a delicious picnic lunch and siesta before taking a slow paddle back to the lodge. Enjoy an evening game drive, stopping for drinks and nibbles before returning to the lodge for dinner. After morning tea or coffee on your private deck, explore the park one last time on foot, taking a guided early morning walk, ending with a farewell bush breakfast along the river. On returning to the lodge, a final road transfer to Victoria Falls Airport for your onward adventures or journey home.